My family can't wait for Dr. Seuss's birthday on March 2nd. 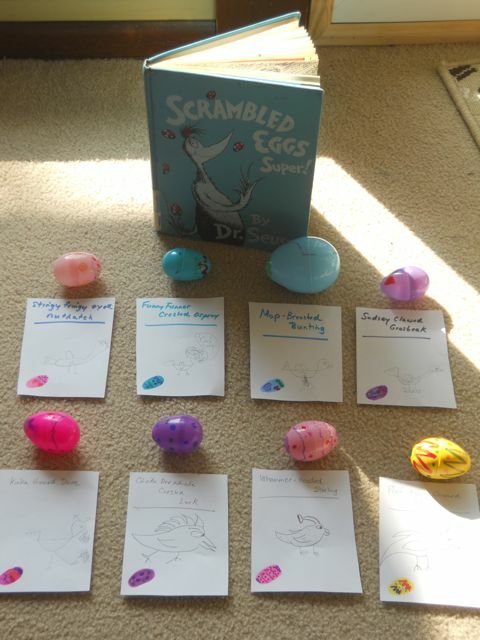 It may be January, but this weekend his books were all over our living room floor. We reread a few of our favorites like The Sneetches and Other Stories and You're Only Old Once. We also read Yertle the Turtle and Other Stories for the first time as a family. 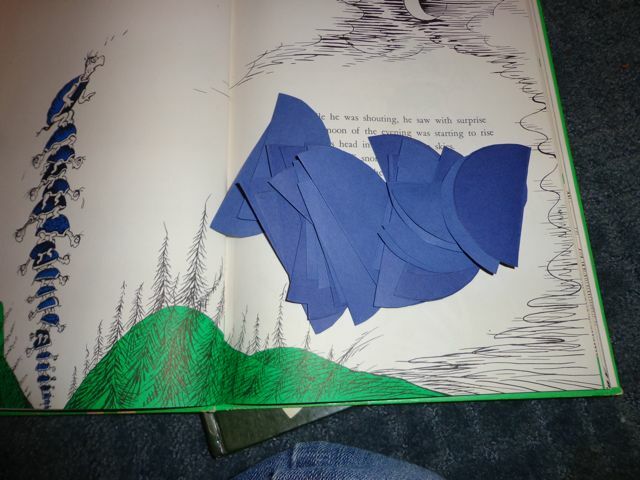 This book inspired a quick craft that we called "Yertle the Turtle's Countdown to Dr. Seuss's Birthday"! 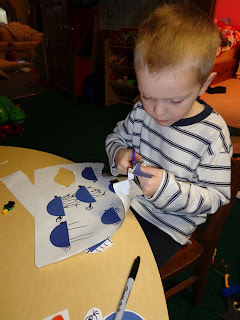 This craft can be used in your home, classroom, or library as a way to build anticipation for the year's most widely celebrated author birthday. I used a yogurt container to help me trace 15 circles on a large piece of blue construction paper. Then, I cut the circles out. I cut each circle in half, which made 30 turtle shells. 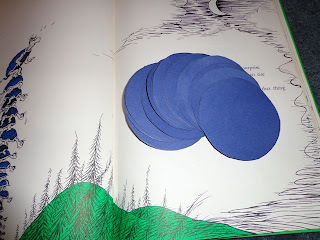 We glued the blue half-circles to a white piece of construction paper. Then, we drew legs, necks, and heads on the white paper coming out of the blue shells. Oh, don't forget your turtle tails. We did that a few times. Next, we cut the turtles from the white paper. 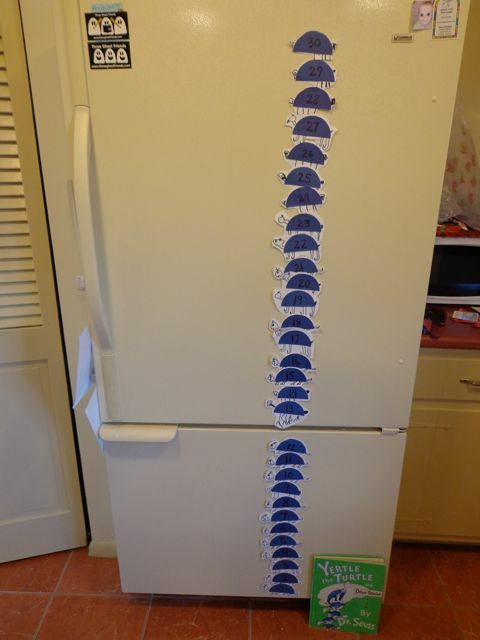 We wanted to display our countdown on our refrigerator. To do this, we found a few thin refrigerator magnets that we didn't need anymore -- 2012 calendars, business cards of companies we will never use, etc. We cut them into small pieces. We placed rolled packaging tape on the backs of the magnet pieces. Then, placed them on the backs of the turtles. 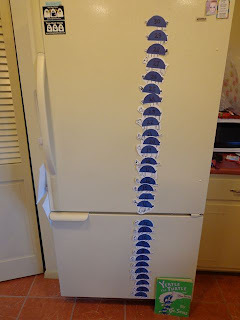 Once all the magnets were in place, we numbered the turtles, and then it was time to stack them up. We made 30 turtles, so we can begin our count down in early February!! Each day we will remove a turtle until we get to the big day on March 2! "Turtles! More Turtles!" he bellowed and brayed. And the turtles 'way down in the pond were afraid. We will have to watch our little one. 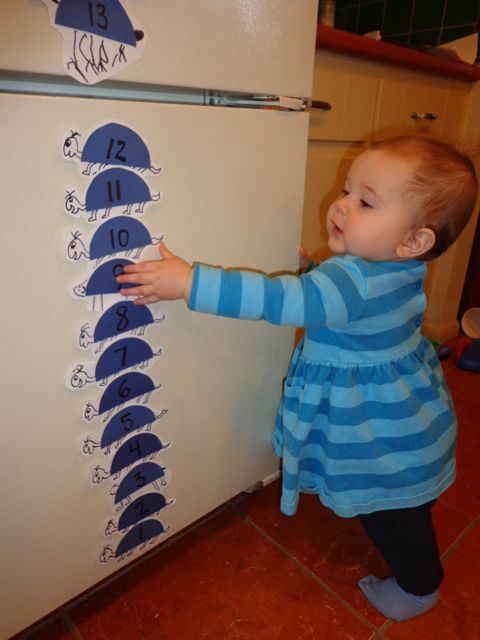 She wants to peel the magnets off the back and that is not good. So, our countdown is going to be shifted to the upper half of our refrigerator. 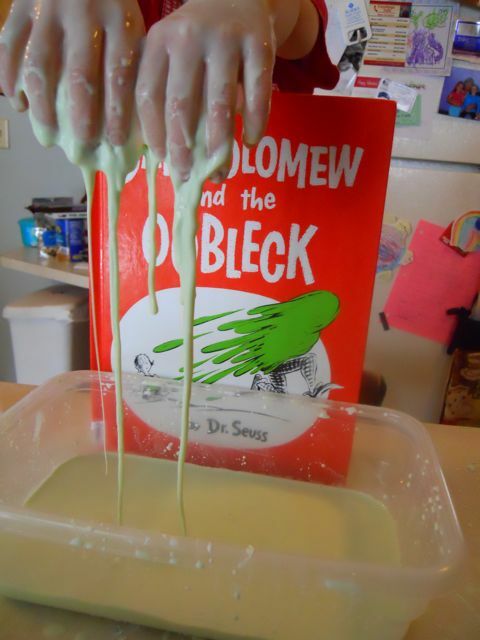 Need ideas to help plan your own Dr. Seuss Birthday celebration at your house? That's a lot of turtles! Looks like fun. (And your daughter is getting so big.) I'm looking forward to what else you might have planned between now and March 2nd. It was a lot of turtles. They almost didn't fit on the refrigerator! She is getting big...I can't believe she is 10 months old already! 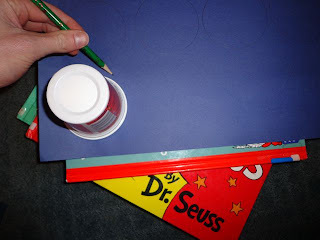 I have a few other ideas brewing right now for Dr. Seuss's birthday. Stay tuned! I love your ideas. Looks like something any age kid can do. How many birthdays are your children aware of? Do they get excited when, say Dr. Seuss's birthday rolls around (the day before mine, now I have no excuse not to remember)? I found your site one other time and have been trying to find it again ever since. Thanks for joining the Kid it Hop. Thank you Sue! 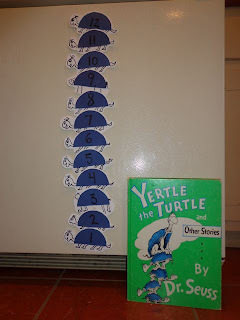 We had fun making the Yertle the Turtle countdown, and I think it is going to be even more fun using it to build anticipation to Dr. Seuss's birthday. Dr. Seuss's birthday has been celebrated in our house since my daughter was 1 year old (2007). It is so much fun knowing that other families and schools are celebrating right along with us. Thanks for coming back to the blog and I hope you stay connected with us. Really fun projects you've set up for littles! I love all your fabulous projects! 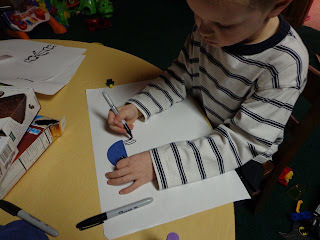 One of the best discoveries I've ever made are sheets of magnetic paper - oh the fun!! Thanks for hosting this fun linky! I love the picture of your little girl with the turtles! Thanks for stopping by Taking Time To Create and for following my Pinterest boards. I'm following you on Pinterest now too! 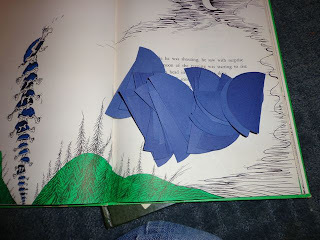 I liked up my first Dr. Seuss-A-Thon post. Thanks for the invite. Thank you everyone for all your submissions to the linky! There are so many creative ideas! We can't wait for Dr. Seuss's Birthday! 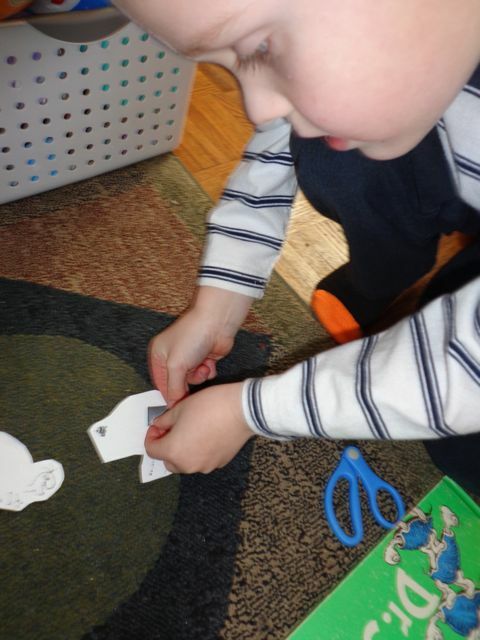 I love your turtle craft.... so much fun. Thank you for the great ideas~! Thank you for the invite! This is such a fun way to share and find so many great Dr Seuss ideas! 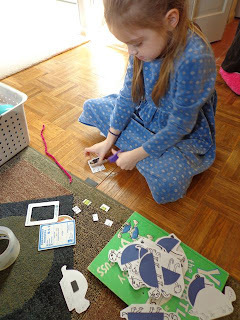 I posted my How to Create Your Own Wocket in my Pocket idea! 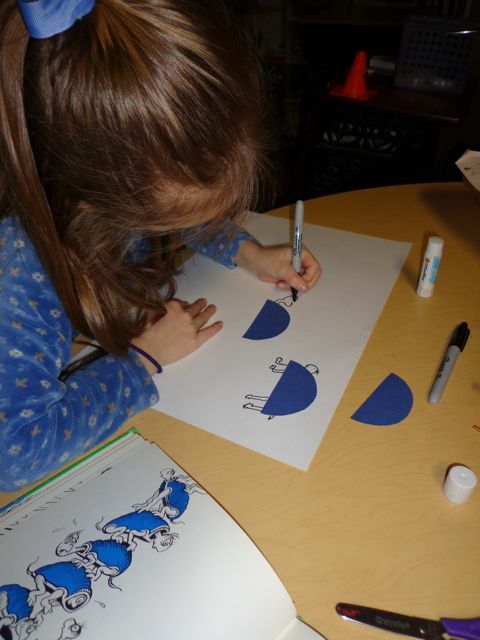 That's a great Yertle the Turtle activity! Thanks for inviting me to join the link-up. We're having so much fun this week thanks to Dr. Seuss!! !